Susan Austin, graduated from BA (Hons) Fine Art, progressing onto the MA Contemporary Art Practice and establishing the FreeWheeling art initiative. Sue graduated from the University’s BA (Hons) Fine Art degree in 2009 with a first class degree. Determined to further her broaden of artistic skills and understanding, Sue progressed onto the MA Contemporary Art Practice programme with the University where her work continued to attract local and national attention. A mature student who has been wheelchair-bound for much of her life, Sue’s work as a multimedia, performance and installation artist often revolves around, and indeed sometimes actively involves, her wheelchair. Sue came to the attention of the press with a controversial project during her undergraduate degree where she used a specially modified paint wheelchair to weave lines across the length and breadth of Plymouth city centre and the University campus, joining together the two sites for the 2009 Art and Design Degree Show. Sue says she "aims to find dramatic and powerful ways to re-position disability and disability arts". "The University has helped to introduce me to a broad range of contemporary fine art practice and developed in me a sound understanding of the interaction between materials, processes and ideas. The intellectual and practical demands of the Fine Art degree have enabled me to develop my thought processes, and research methodology and have given me the capacity to undertake critical visual and contextual analysis. My tutors encouraged me to be ambitious and adventurous in my work and this culminated in a project that explored the mark-making possibilities of my power wheelchair. By painting wheelchair traces through the city, joining the two fine art sites for the Degree Show, we opened up a debate about what does and doesn't constitute art. The Disabled Students Assessment, flexible course structure and support of tutors have been invaluable. The quality of input from teaching staff gave me the passion and energy to continue onto the MA Contemporary Art Practice, which would have been unimaginable when I returned to education as a mature student." You can find out more about Sue’s work by visiting the FreeWheeling arts initiative web site. Pushing the boundaries of art and forcing people to reflect on their view of disability, Sue's masterpiece 'Creating the Spectacle!' 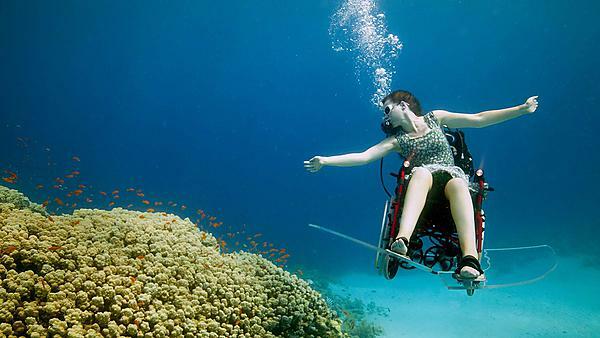 is a ground-breaking series of live art and film events recording an underwater wheelchair as it flies through the water. Sue Austin talks about how her experience in a wheelchair has influenced her art and perspective on the world at a TEDxWomen talk, curated and produced by The Paley Center for Media.